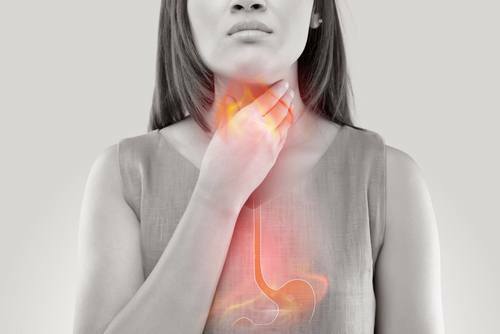 Sometimes chronic coughing, throat clearing, or chronic hoarseness can be symptoms of Laryngopharyngeal Reflux (LPR). An estimated 40% of the American population is affected by reflux disease – roughly half of which manifest with atypical symptoms. LPR, is a condition in which stomach acid leaks out of the stomach and into the esophagus and throat. The acid irritates the throat and the vocal cord area. Children are also know to have this condition. 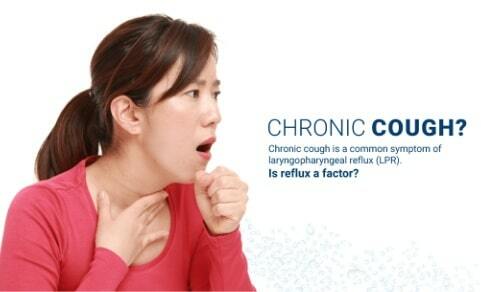 It may result in cough, tonsil and adenoid problems, and sinus infections. LPR can cause many symptoms including muscle spasms throat. Some people with LPR report little or no heartburn. In fact, about half of the amount of acid can cause problems when it moves up to the throat in the vocal cord area. The laryngeal area, compared to the esophagus, is much more sensitive to irritation and injury from stomach acid. Reflux usually occurs at night when we are sleeping. When we sleep, the stomach muscles and the esophagus relax and open slightly. This can allow acid in the stomach to travel up through the esophagus and irritate the back of the throat where the vocal cords sit. It may take 8 to 12 weeks of daily usage of antacid medication along with diet and lifestyle modifications before reduction/resolution of symptoms occurs. In some cases, morning and evening dosages of medication are required. Your physician will speak with your regarding additional dosing if necessary. The following instructions are designed to help reduce production of stomach acid, and prevent acid from coming up the esophagus. If theses measures do not help, or if symptoms get worse, let your doctor know immediately. Symptoms may be aggravated by ingestion of aspirin, chocolate, sweets, citrus fruits and juices, highly spiced foods, alcohol, tobacco and caffeine-containing beverages such as coffee, tea, or colas. Avoid chewing or sucking candies, gum, lozenges, etc. on an empty stomach. The oral stimulation causes an outpouring of stomach acid. Symptoms are more likely to occur while lying flat. Avoid lying down directly after meals. Try not to eat for two hours before retiring. For nightime relief, sleep with the head of the bed elevated from 2-4 inches. If this is not practical try a wedge pillow. Clothing and/or belts that fit tightly across the midsection of the body should be avoided. Do not bend or stoop anymore than is absolutely necessary. This includes activities such as gardening and exercises requiring lifting or bending. Maintaining a relaxed attitude in your activities helps to reduce symptoms. Limit dairy product consumption, especially late at night. Make efforts to drink at least 6-8 ounce glasses of water each day. A pH Probe by Restech is placed to measure the amount of aerosol gastric acid in the airway. A detailed report is generated to provide the best treatment plan. The pH probe allows objective data to be collected and compared with prescribed interventions designed to eliminate reflux. This probe results are viewed on a detailed activity report which provides critical data to appropriately develop a treatment plan. For more information on the treatment of reflux or to make an appointment, call ExcelENT of Alabama today.